Call 1st Cooling to rent a spot cooler. Buy a spot cooler 2 Tons (24,000BTU/hr) or more. We have a few models of 2 Ton spot coolers and portable air conditioners. For a description of BTUs and how cooling works, click Portable Air Conditioner Basics. Most customers use spot coolers whenever they have a short-term need to cool a space while their primary air conditioner is being repaired or when they need to cool an area that is too hot. Rent and cool your space using one of our portable air conditioner rentals. That’s where 1st Cooling comes in! 1st Cooling provides effective climate control all over the US through our locations and network of companies. Portable air conditioners also dehumidify the air therefore are dehumidifiers. Rent a dehumidifier from us! The moisture removed from air molecules by the evaporation process is called condensate. The condensate is usually collected into a reservoir inside the spot cooler. When the reservoir is full, it is pumped out through a little tube to a sink drain. Rent a Portable air conditioner to provide emergency cooling, spot cooling, or supplemental cooling where and when you need it. Our air-cooled units provide cold air that blows typically 25-30 feet from the front of where the unit is sitting. Since it is an air conditioner, hot air from the condenser coil must be exhausted somewhere out of the cooled space. The hot condenser air is exhausted through round flexible tubing (duct). Typically we exhaust the hot air through the ceiling plenum (the space above the suspended or drop ceiling tiles) through a piece of flexible duct similar to the silver duct that comes out of your clothes dryer (except much larger in diameter). The units can also be used outdoors for spot cooling your party or special event. 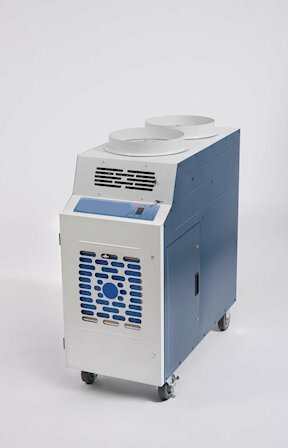 The Model 1SKK-2421 air-cooled portable air conditioner is perfect for cooling spaces around 800 square feet with a 10-foot ceiling. The 23,500 BTU/hr spot cooler requires a 220 Vac receptacle. 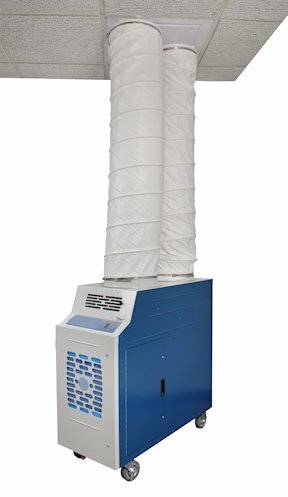 This portable air conditioner is perfect for “tight” rooms such as a computer room or telephone equipment room where you need to pull outside air to cool the condenser.